Like other times of inflection in the stock market, we are seeing technical studies and indicators light up like a Christmas tree. So why not throw another couple stats on the pile? 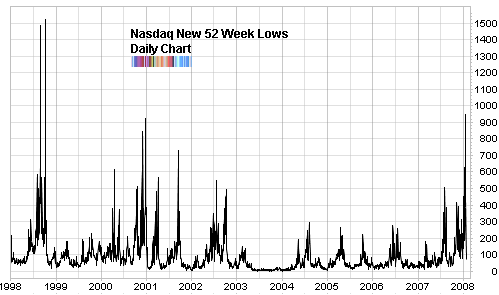 Below are the charts of new 52 week lows for the Nasdaq and the NYSE. Similar to other indicators I’ve mentioned recently, this one spiked to a multi-year high last Tuesday (January 22nd 2008). 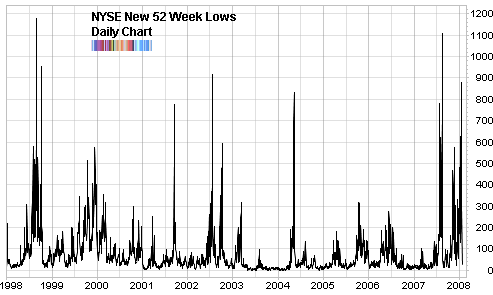 In fact, you’d have to go back to the market turmoil we saw in 1998 to find a higher number of new lows! The NYSE graph looks different mainly because a significant portion of the securities traded there are non-common stock but rather bonds, municipal bond funds and structured funds which are sensitive to interest rates. Nevertheless, we can see the same pattern. As with the weight of all the indicators that I’ve looked at, this one is saying that it is time to look for buying opportunities, rather than selling or selling short. Based on most of the sentiment indicators, it certainly looks like great buying opps are here. I’d like to open some discussion on what the opposing viewpoints are… Could this become a self-fulfiling prophecy? Will the bond market turmoil top the initial mortgage issues? I’d like the ‘devil’s’ advocate position here as well to be balanced. While it’s entirely possible that the low on this move has already been recorded, I’d like to point out that after wipe out moves similar to this one, in the past lengthy and significant moves up have usually followed. Missing the first few points of such an up move won’t matter much. I’m looking for a more reliable “W” formation in the major averages. Don’t we have a LOT more issues trading now than 10 years ago?? I think it is strange to measure with absolute numbers instead of relatives. I can’t figure out one situation where absolute numbers give more info than the relative ones. I know that we don’t always find that data so easily but wanted to point it out anyway. Johan, you’re correct, we do have more issues but that becomes problematic over the long term. The graph I showed only covers 10 years. In any case, I’m going to share another graph which will iron out this problem.